It’s that time of year again. The time when everybody in my family brings a can of cranberry sauce to my house…just in case. I guess you can say we are a cranberry sauce loving family, the canned kind. I’ve made numerous delicious cranberry concoctions over the years, but the can always reigns at the table. I even did cute cranberry sauce cut-outs with the cranberry sauce one year and my family was convinced it wasn’t their beloved canned sauce. I guess they are purists-they like to see the can marks! At least it is easy to serve, open a can, slide it out onto a dish, (another topic for debate-some like it in a bowl, others a plate…so we do both) and strategically place a butter knife on the side. Yes, on the side, it is an honor to have the first cut of the cranberry sauce! After that it is fun to sit back and observe the cranberry sauce to turkey ratio on everybody’s plate. Over the years, I have learned to embrace the extra cans of cranberry sauce. One, I would never think to waste it, after all, it takes about 200 cranberries to make one can and two, it is perfect for leftovers! If it wasn’t for excess canned cranberry sauce, my hubby wouldn’t have one of his favorite muffins Cranberry Coconut Muffins and I wouldn’t have this go-to sauce. This recipe is based on my “famous” cream sauce. “Famous” for it was a base for a cheese sauce I made in the World Food Championships this year. There is a secret ingredient I use when making any cream or cheese sauce and I’m sharing it with you. It’s brandy! Brandy adds another dimension to cream sauces. 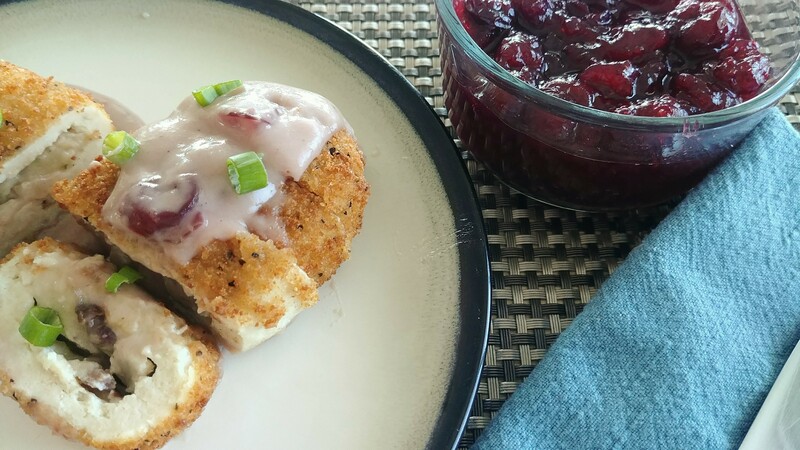 In this recipe, it helps cut the sweetness of the canned cranberry sauce. What’s the easiest thing about this stuffed chicken? It uses any leftover stuffing or dressing, as we like to say. This sauce is not only great for stuffed chicken but also for leftover turkey and baked pork chops. I’ve also been known to ladle this goodness up over toast and biscuits! Flatten chicken breasts. Chop brie rind and mix into the leftover stuffing or dressing. Spread each chicken breast with 1/4 cup dressing mixture. Roll tightly and secure with toothpick. Dip each in egg, then into bread crumbs. Place chicken, seam side down, in a lightly greased shallow baking dish. Bake 35 minutes or until juices run clear. Whisk in flour, pepper, salt, and nutmeg. Continue to whisk until thick and smooth. Gradually whisk in milk and brandy. Continue to whisk until mixture bubbles. Whisk in cranberry sauce. Continue to whisk for 1 minute. Add cheese. Keep whisking until cheese is melted. Slice chicken breasts and top with sauce. Put Your TO COOK IS TO CREATE Thinking Cap On: What other flavors would compliment this sauce? How about some orange zest? Cinnamon? Ginger? Don’t have any brandy? Substitute an orange liqueur or triple sec. What other stuffing would be good for the chicken? Apple and spinach, ham and cheese, sausage? What other ways could you enjoy this sauce with leftover turkey? How about as a way to change-up Turkey Tetrazzini? Or as a fancy Hot Brown turkey sandwich? How about ladled up over crepes? Think about some of your favorite recipes that use cream soups or cheese sauces in it. Could you substitute this sauce? Think about how you enjoy cranberry sauce. Not a brie cheese fan? Use Swiss cheese. Need a quick dip? Whisk in 8 oz cream cheese until melted instead of the brie and serve with crackers. FOOD FUN: Has any of your holiday leftovers turned into a tradition? Is there a leftover dish your family eagerly waits to taste? According to foodreference.com, Americans consume 5,062,500 gallons of jellied cranberry sauce every holiday season. I’m happy my family not only greatly contributes to that number but also helps me create new ways of enjoying it. Got my immediate attention with just reading the title…..all of my favorite things wrapped into one delicious meal! Creamy Cranberry Brie Sauce Stuffed Chicken is a melt in your mouth recipe. Easy to make and oh so delicious. Definitely a go to meal any day of the week and with all of the extra holiday food this dish can be made various ways too. Great idea and certainly one everyone should try. Yum!